Let me just get this out of the way. Tucson is awesome! It only took one weekend in town to fall completely head over heels in love. And we are already planning to return. 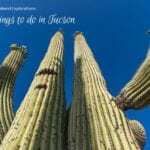 We knew when we started researching things to do in Tucson that there was way too much to see in a single weekend, but trust me, we made a valiant effort! In reality, the weekend we spent in Tucson was not our first. During our RV sabbatical, we stayed at the really awesome KOA near the fairgrounds. It was only 1 of 2 parks we stayed at during our near 2-years in the RV that had solar energy (the other one being in Santa Fe). We also visited while staying in Phoenix when we totally geeked out at the Pima Air and Space Museum and wolfed down some of the best tamales I’ve ever had. But for this weekend we were on a mission, we wanted to get a taste of some of the best things to do in Tucson. It was a reconnaissance operation to explore what we wanted to come back for. Given that it is only a 2-hour drive from Phoenix, we have the opportunity to return often. Trouble is, now that we’ve discovered just how truly awesome Tucson is, we may need to spend every weekend here! But if you only have one weekend, let me give you some of the best things to do. 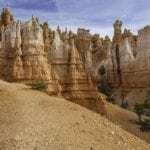 While Arizona has a lot of national monuments, trails, and recreation areas, it also has 4 national parks, with the most famous one, of course, being the Grand Canyon. 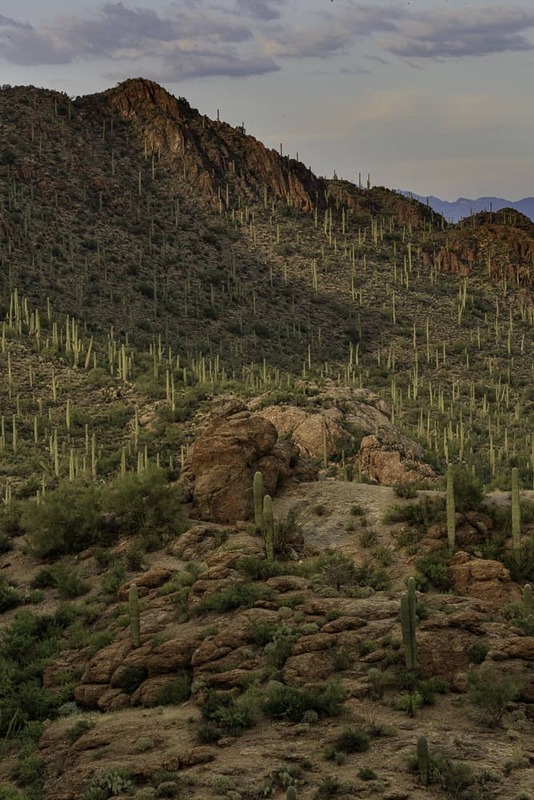 However the big advantage to visiting Saguaro National Park is that it is so close to Tucson, you truly have the best of both worlds. Hikes and visits to the two parts of the national park and a huge variety of infrastructure and logistics to choose from when it comes to hotels, restaurants, and things to do. Summertime is monsoon season in Arizona and the weather can change very quickly going from dark and gray to perfectly blue skies, it is a really cool phenomena we are adapting to as new Arizonians. We visited both the west side of the park which has a dirt road loop trail, short hikes with sites like petroglyphs and where the saguaro cacti are denser, and the east side of the park which has a larger driving loop (paved), trails and taller more spread out saguaro since this part of the park is at a higher elevation and gets more rain. The saguaro cactus is not endangered but it is protected in Arizona. There are regulations about harvesting, collecting or destroying them. What is so interesting about this species is the arms that they grow take 75-100 years for the very first one to show up. After that, they can have as many as 25! The variety of cacti in the park is outstanding and we saw some of our old friends like the ocotillo which we saw a lot of in Borrego Springs and the cholla which there is a whole garden of in Joshua Tree. Word of caution about the cacti everywhere, be careful everywhere you step! We returned to the western part of the park to try a sunset one evening. There is a really great trail and overlook at Gates Pass. We hiked up the trail but the sunset wasn’t spectacular and I was a little afraid of climbing down the rocks in the dark (mainly because my other pair of too-big-for-me pants which were sliding down as we descended!). 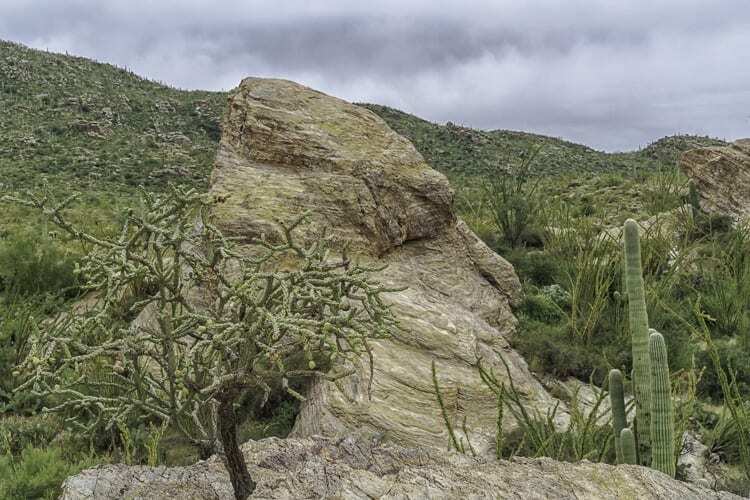 The Sonora Desert Museum is a largely outdoor site just outside the western part of Saguaro National Park and it’s outstanding. The museum really captures the essence of desert life. We enjoyed our visit so much that we became members. There is a small zoo, a huge botanical garden, and art gallery. We learned so much during our visit and plan on returning for more photography including sunsets on Saturday when the museum is open later. A rare Mexican gray wolf. This spot is less of a museum and more a living experience. You will see flora and fauna everywhere you look. My advice to you is to arrive early (it is the desert after all) bring plenty of water, wear a hat, put on sunscreen and have good shoes for walking in the sand and rocks. There is a small cafe inside the museum shop, also a tiny ice cream shop – those will both get you cooled down after your explorations! We really enjoyed our visit to the Desert Botanical Garden in Phoenix so decided to check out the Tucson Botanical Garden to see what it was like. Plus we read that they have a secret weapon. Inside the gardens is an adorable restaurant called Cafe Botanica run by longtime and raved-about Tucson native and Gallery of Food chef, Kristine Jensen. Cafe Botanica inside Tucson Botanical Gardens. It’s a beautiful oasis inside the gardens and a great place to have breakfast or lunch, or even just a cup of coffee, which is all we had room for after our big breakfast (more on that later). We sat and spoke with the server about the food, the restaurant, and the local Tucson area. In between helping others and speaking with us, she visited with a beautiful bird on the terrace. Meet Frank. Isn’t he a beauty? He was just one of many birds we saw as we explored more of the gardens. Whether you eat inside or on the terrace, the culinary traditions of the Sonoran desert are celebrated in unique dishes that also mimic the current garden exhibition. At the time of our visit, the exhibition was focused on photographs of Frida Kahlo by Nickolas Muray. But at the moment they are getting ready for the return of the butterfly exhibit in October and the new focus is on Origami in the Gardens. I took a moment on the terrace to gather my notes. I could see myself spending quite a bit of time writing here! Maybe I can be their blogger in residence! We learned a lot in the individual exhibits and I think they are very smartly laid out because it is not a huge space. 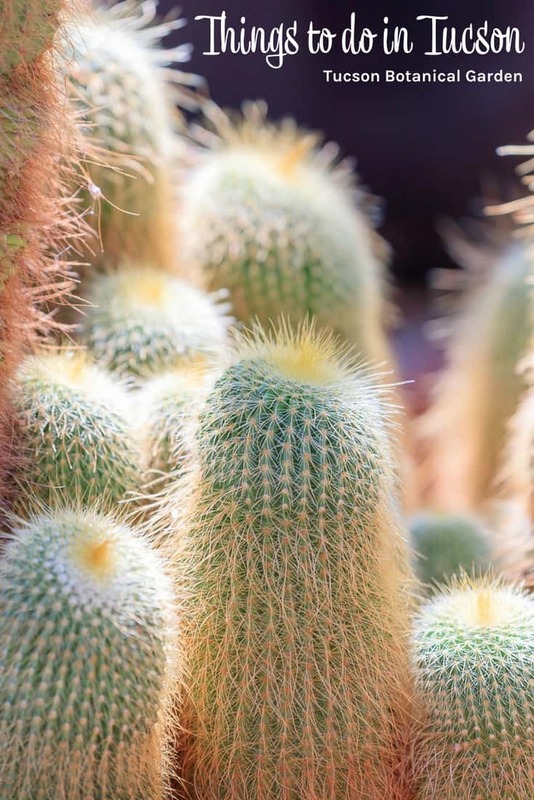 And now I’ve got some new favorite trees like the Chilean mesquite tree with gorgeous twisting branches offering an amazing amount of shade and these adorable cacti which you just want to pick up and cuddle…but don’t! Mr. Misadventures thoroughly enjoyed taking photos of the beautiful displays and I took a moment to check my Insta in the Zen garden. Bloggers never stop! My Type-A-Mom “Blog hard. Play hard.” captures the spirit of that! The gardens have a couple of cool events like the Dog Days of Summer where you can bring your pet inside and let them explore with you. Pro tip: The gardens are open later (4:30 -8:30) on Thursday and Friday evenings and the restaurant also serves dinner on those nights. If you make a reservation for the restaurant you get into the gardens for free after 4:30. For a little more culture we headed to the beautiful Mission San Xavier de Bac just outside of town. 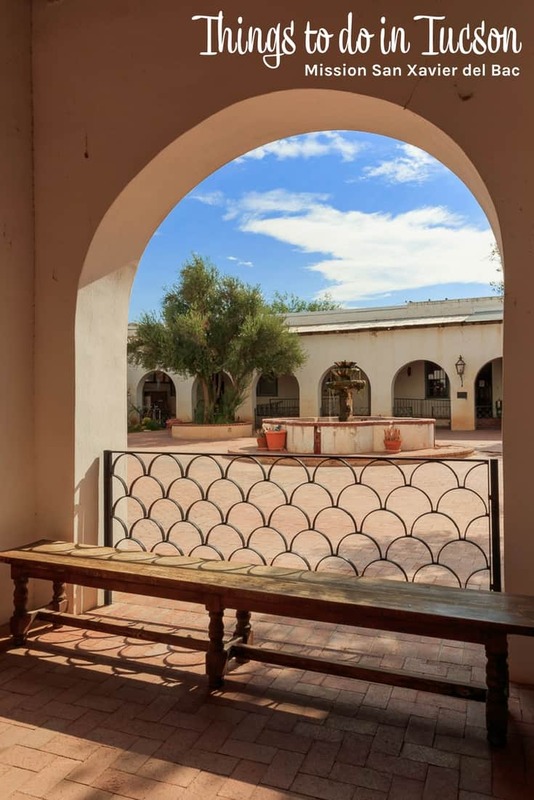 Actually located on the Tohono O’odham San Xavier Indian Reservation, it’s a Catholic mission and the oldest intact European structure in Arizona. It is currently undergoing renovations making it hard to photograph, but I did get a good shot from the parking lot. I lagged behind Mr. Misadventures because I was checking out some stands that were set up to cook fry bread and other Indian dishes. I got distracted (what else is new)! It was Sunday morning and an extended mass for the victims of Harvey was taking place so we were unable to visit inside, but we checked out the museum and beautiful courtyards. Next door (not officially on mission grounds) is Grotto Hill which offers great views of the city. The entrance to the hill is guarded by two lions statues. There are also a few other lions on the mission grounds so I am intrigued as to what they symbolize. We will definitely be back to see inside the church. And maybe to eat some fry bread. In an attempt to build and strengthen the city’s vibrant culture and support artists (as well as mitigate graffiti and improve underserved areas of the city) Tucson supports an ongoing murals project. Many of the murals are found in the Warehouse Arts District, but we saw murals all over town. Although murals of have been written about as far back as 2006, a lot of the newer ones were added in 2016. We didn’t have nearly enough time to explore them all and I have a ton of pictures for another post when we capture the rest, but this one on the side of the Tucson Warehouse and Transfer Co. building as you enter the Warehouse Arts district is beautiful. Isn’t it fantastic? At night, the colors seem to get brighter in the twilight. The mural is located at the corner of East 6th Street and North 6th Avenue. The building was built in 1918 although the company’s history dates back to 1892. There is also has a really cool vintage sign on top (not pictured). If you want to find the Greetings from Tucson sign, it’s located at E 7th Street and North Arizona Avenue (one street over from North 6th Avenue and a few streets over from North 4th Avenue where there are lots of funky shops, bars, and restaurants) and is part of a really cool project called Greetings Tour. You can read more about how this mural was created on their site. NOTE: we went by at night and the mural is lit, but they are fluorescent light which is terrible for photos. The first two times we passed by someone was parked in front of the sign (bummer). And some lamebrain decided to put a Port-a-Potty next to the mural so you really have to be careful with your shots! 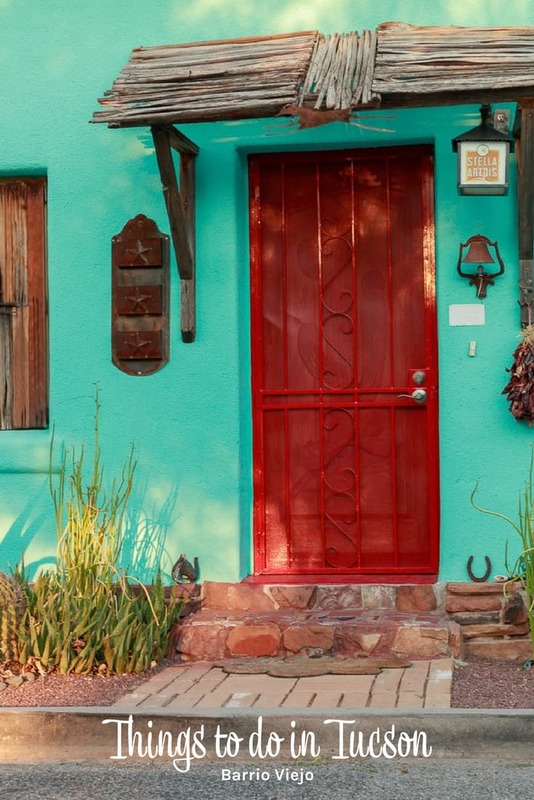 There are several historic districts in Tucson, in fact as we drove around exploring we kept running into new ones, but hands down our favorite was Barrio Viejo, which is also one of the most colorful. As the name indicates, Barrio Viejo is an old neighborhood made up of 19th-century homes, many of them adobe style with a rich history of inclusion and cultural diversity. The small one-way street of South Meyer Avenue running between 17th and 20th has a lot of colorful homes that just beg to be photographed! There are other neighborhoods that boast colorful adobes and we will be seeking them out on future trips. As I mentioned, we didn’t visit Pima Air & Space Museum on this trip, but it is worth mentioning if you are planning a weekend in Tucson. This was the funnest museum I’ve ever been to! We’re space and history geeks in the Misadventures household so that along with the ability to climb on planes – cool! 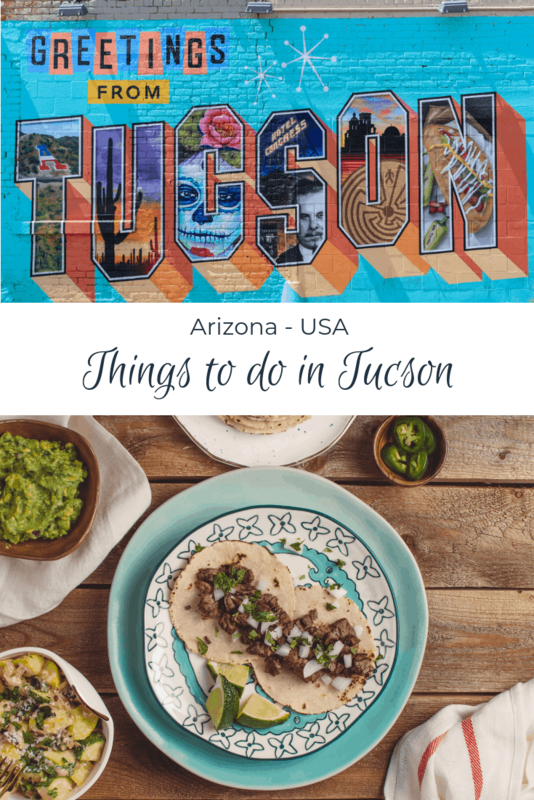 This post is about things to do in Tucson, not about the food, but if you have been reading Misadventures with Andi for any length of time you’ve probably figured out that food makes my world go around, so of course we tried out a few restaurants. But I’ll be honest with you, we are still in the thick of our low-carb high-protein diet so we decided the best strategy for us was to eat a big breakfast which sustained us through lunch and then eat a simple salad for dinner. Our strategy worked for us in that we had two amazing breakfasts, but it doesn’t work for you in terms of giving you recommendations for meals. Fear not. When we found out that Tucson is the ONE and ONLY place in the United States that has been designated a City of Gastronomy by UNESCO, Mr. Misadventures nearly fell out of his chair and I nearly stopped our escrow process to look for a home there! Yes, I love me some national parks and beautiful gardens and fabulous murals, but this girl loves all the food and we are going to be spending a lot of time in Tucson learning more about its devotion to its food heritage, and I’m pretty sure I will be praying at that altar. One breakfast we did enjoy was at 5 Points Market and Restaurant, an American bistro with fresh local ingredients near the Barrio Viejo. We were so impressed with this spot that we have already reached out to the owners to learn more. 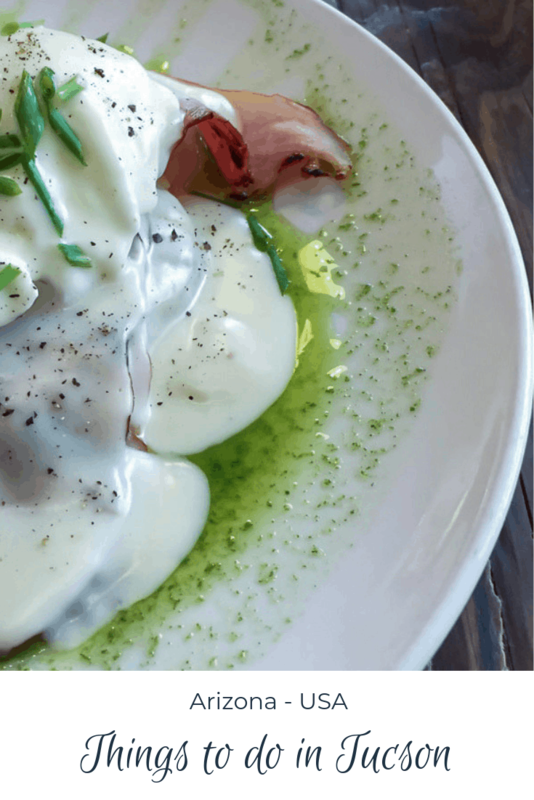 I had their Bandito Blanco from with grilled shaved ham and poached eggs served over a potato pancake with house mornay sauce (a French Béchamel sauce with grated Gruyère cheese). The potato pancake was a real treat given our diet but was worth every cheat day bite. The other breakfast that Blue Willow, a Tucson mainstay set in a 1940’s adobe home serving home-style goodness. We arrived about 15 minutes before they opened and found a whole bunch of people waiting including a family that spends every birthday and anniversary at this little spot. I went with the Blue Willow Special which is scrambled eggs with shredded chicken, Hatch green chiles, tomatoes, chopped corn tortillas, cheddar cheese, warm salsa, and sour cream. For the sake of the diet, I had to pass on pinto beans and warm corn tortillas which come on the side. That made me sad, but only until I ate the first bite. One breakfast we absolutely did not enjoy was at the Congress Hotel. The service was indifferent, the food subpar (although they do have a good menu writer) and the interior is dirty. It is a very popular spot due to the hotel’s history, but I say walk around and look at the property, maybe have a beer on their terrace if you must, but pass on eating there. I love cowboy history. So the idea of visiting Old Tucson Studios, a movie studio originally built in 1939 by Columbia Pictures and now converted into a theme-park seemed interesting. But when we drove up to take a look (it’s just outside of the western part of Saguaro National Park) it was (a) really expensive for what it is and (b) really kitschy. You are much better off driving to Tombstone which is not too far from Tucson. That my friends is our whirlwind 3-day holiday weekend in Tucson! Whew. And as you can see, it’s not a problem to find things to do in Tucson, the problem is that you will want to go back over and over again, which is pretty much the situation we are in now! How about you? Have you been to Tucson? Did you do any of these things? Did you do something else? Got any restaurant recommendations? If you haven’t been to Tucson, have I convinced you that you should visit? Do tell! > Saguaro National Park EAST (also known as the Rincon Mountain District) is located at 3693 S. Old Spanish Trail, Tucson, Arizona 85730. > Saguaro National Park WEST (also known as the Tucson Mountain District) is located at 2700 N. Kinney Road, Tucson, Arizona 85743. > The Arizona-Sonora Desert Museum is located at 2021 N Kinney Rd, Tucson, AZ 85743. > The Tucson Botanical Garden is located at 2150 N Alvernon Way, Tucson, AZ 85712. Cafe Botanica is inside the gardens. > Mission San Xavier del Bac is located at 1950 W San Xavier Rd, Tucson, AZ 85746. > The leopard mural is located at 7th Ave and Toole Ave, Tucson, AZ, 85705. 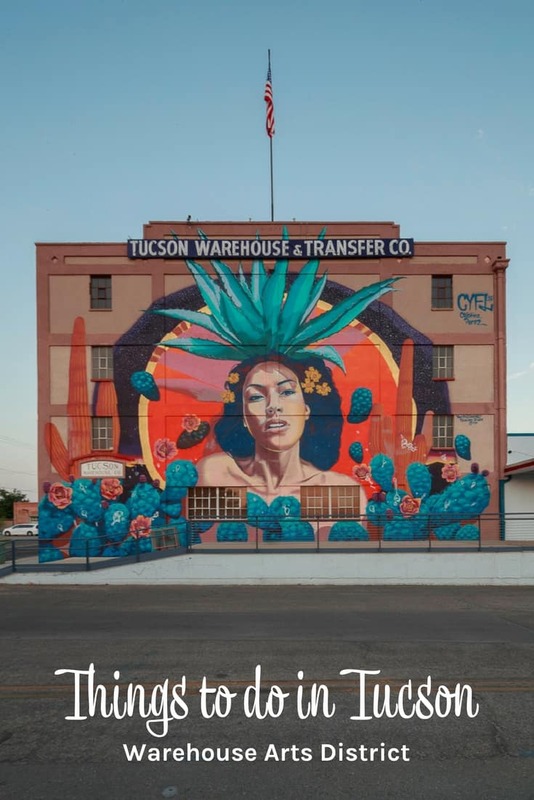 > The mural on the side of the Tucson Warehouse and Transfer Co. building is located at 100 E 6th St, Tucson, AZ 85705. > The Greeting from Tucson mural is located at the corner of 7th St & N Arizona Ave, Tucson, AZ 85705. > Barrio Viejo colorful homes are found on South Meyer Avenue running between 17th and 20th. > Pima Air and Space Museum is located at 6000 E Valencia Rd, Tucson, AZ 85706. > 5 Points Market and Restaurant is located at 756 S Stone Ave, Tucson, AZ 85701. > Blue Willow Restaurant is located at 2616 N Campbell Ave, Tucson, AZ 85719. This is awesome! I live in San Tan Valley so not too terribly far from there. Now I have a starting point for a mini vaca. @Marissa, so glad you found our early explorations helpful, you will have a GREAT time in Tucson! I have yet to get to Tuscan. My family would love to visit the Pima Air and Space Museum though! @Heather, it is TOTALLY kid friendly and a blast! How cute are you?!? I’ve actually never been to Tucson despite the few summers I spent in AZ in college, so I think we need to add all this to our agenda whenever I make it out to see you. It looks like my kind of town! @Kristin, there is definitely a lot to choose from, I’ll be thrilled to see you! WOW! What breathtaking pictures! I love nature and it seems like you had a beautiful and fun adventure! @ejnosillA, with the city being surrounded by beautiful parks and nature, it is a wonderful combo! @Tamara, all the more reason to come back. I did prefer Tombstone over the studios, but yeah, it is a check this off my list sort of thing! Did you get to both sides of the park? @Laura, ha! I love a good blogging shirt! And the food….ay, carumba! These photos are truly beautiful! I have not been to Tucson (We are usually in Phoenix), but it looks like we need to make a special trip. The architecture looks so traditionally Southwestern! @Cynthia, you do! Skip Phoenix and head straight to Tucson! Wow, what an amazing post on Tucson. I didn’t realize Tucson had so much going on. I used to visit a friend there and somehow we missed most of this! She’s since moved to Phoenix, but I see a road trip in our future during my next visit! @Kelly, well now you have a reason, many of them in fact, to return! I am a sucker for cacti and colorful walls so Tuscon sounds great to me! I would definitely want to visit Saguaro National Park to see all the cacti varieties. The Barrio Viejo looks really interesting and picturesque. Thanks for the tips! @Susan, Tucson has everything, I really encourage everyone to visit! I love the colors of the desert. All of the murals look beautiful against the browns and greens of the natural landscape. Looks like Tucson has plenty to offer travelers. @Crystal, I never appreciated the colors until our year-long last year when we spent a good amount of time in the southwest. @Landra, someone else told us about Mt. Lemmon too, it is on our list for our next trip which is soon. You have a GREAT hometown! Looks like a beautiful place to visit! I’ve never been in that area of the country before and I would love to one time! I think it would be so much fun! @Carrie, you should definitely come visit, after visiting the southwest, we moved here! I love Arizona. The architecture is so beautiful there! And the scenery! Wow, what a beautiful place to visit! I really love reading about your adventures and appreciate your honest opinion. 🙂 We live in Texas so I am definitely going to plan a trip to Tucson soon! @Lauryn, that’s a long drive but worth it! I was in Tucson probably 15 years ago now, and the only thing we got to was Saguaro National Park, which I loved. Your article really has me wanting to go back and spend some time. 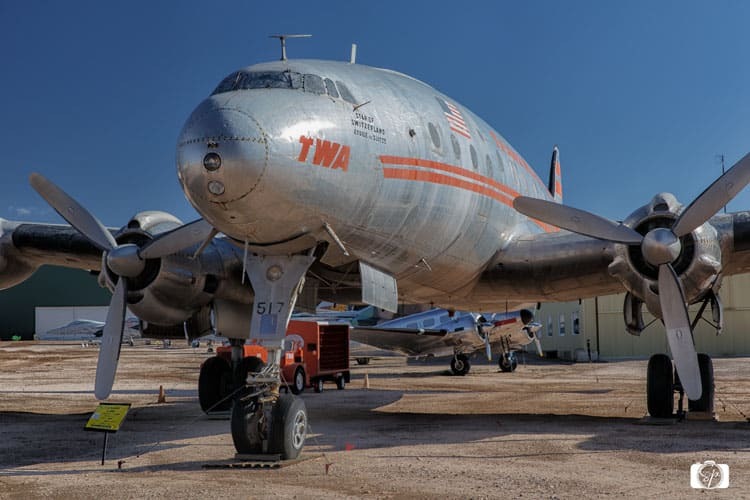 The food looks amazing, and I’d really love to visit both the Botanical Gardens and the Pima Air and Space Museum — that’s a Boeing Constellation in your picture, and I’ve never seen one. I also appreciate your advice on things to miss . . . when you’re in a place for a short time, it’s so helpful to know. @Ann, no one was more surprised about Tucson than I, if we had visited 3-4 months earlier, we might have chosen to live there instead of Phoenix! The air museum is one of the most enjoyable museums I’ve been to and its the type of place you want to visit over and over. I remember Tucson like I was just there. Do you know those rocks you took a picture of at Gates Pass are rigged for climbing? There are two fixed anchors on the top and that is where I would go for ropes practice. Love the Visit Tucson mural as a muse for return trips. You should consider returning for Day of the Dead (“C” in the mural). You might even be able to talk us into joining you. @Jenn, I will let you know when we head there again! You are adorable in front of that mural! I just got back from Tucson but never stepped foot outside of Miraval. It is such an amazing place that, although this was my 5th time there, I still have never gotten to see any part of the city! You make me want to go back to Tucson now and really explore. @Lois, oh goodness you need to check out some of the town, your a foodie, you will love it! @Amit, you most definitely need to add it to your list, you will love it! So many murals, that’s awesome! I really liked your picture of all the Cacti at Gates Pass. This looks like a great place for an adventure! @Maxine, it is, come visit! Had never planned on travelling to Tuscon until I came across this post. It kinda seems like the Wadi Rum desert except for more vegetation. Love the sweeping views too! @Sreekar, I hope you get the opportunity to visit! I’ve been to Arizona this summer but sadly we didn’t visit Tucson but it must be really nice there! 🙂 I would’ve loved to go there! Your post is really interesting and you photos look so beautiful! I have to fly to Arizona again and visit Tucson. @Liv, you definitely need to return and hit Tucson! I’m going to need to visit there! Once the hub and i can start traveling, we will be headed that way! Beautiful! Tysm for sharing! @Ashley, I hope you do! @Juliann, I am on month three and lovingg the area. I figure if I made it through June with temperatures at 120’s I can make it for the 9 months the weather is so awesome! 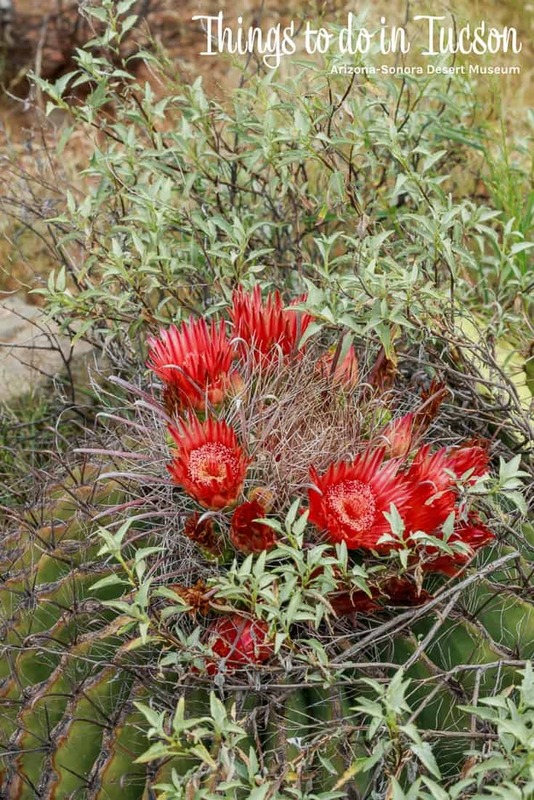 The Tucson Botanical Garden looks lovely and your photo of Frank the bird is gorgeous, love that you gave him a name! The wall art is great so colourful. I’m a foodie and I want to eat the breakfast at the 5 Points Market, the Bandito Blanco looks and sounds delicious! @Lucy, actually the wait staff named Frank, they just introduced us to him. He has a wife and kids too! Tucson is absolutely amazing. Like you, we got hooked on Tucson Tamales and now get them delivered to our home. 😉 They are just as delicious! Also the Sonoran Desert Museum is amazing…the mountain lion exhibit was outstanding. Next time be sure to check out the Mini Time Museum of Minatures. Fun!!! @Michael, what!!! Mail order?? I need to get on that immediately! Oh that museum sounds like fun too, thanks for the suggestion! I’ve only been to Phoenix but this makes me want to return to Arizona. I am a sucker for dessert landscapes and would love to go to Saguaro National Park. @Tucson the area is so interesting to discover, but the culinary scene will definitely keep me coming back! I need to add this to my list of weekend getaways! It looks like you had a great time! @Jordan, you most definitely do! What a full list! We’re going to be exploring out west for the first time this fall, and I’m anticipating more adventures in the near future 🙂 Saguaro looks amazing – and I had no idea it took cacti that long to grow their arms! Or that so many species of cactus can be found there. Definitely on the list 🙂 Thank you for sharing! @Meagan, if you head to the southwest, definitely do not pass up the opportunity to visit Tucson. Oooo Tucson looks like one awesome place to visit!!! And so pretty. I would love to visit one day! @Nick, next trip you MUST include Tucson, it is fabulous and 5 Points is very drool worthy! You make Tucson look so good! 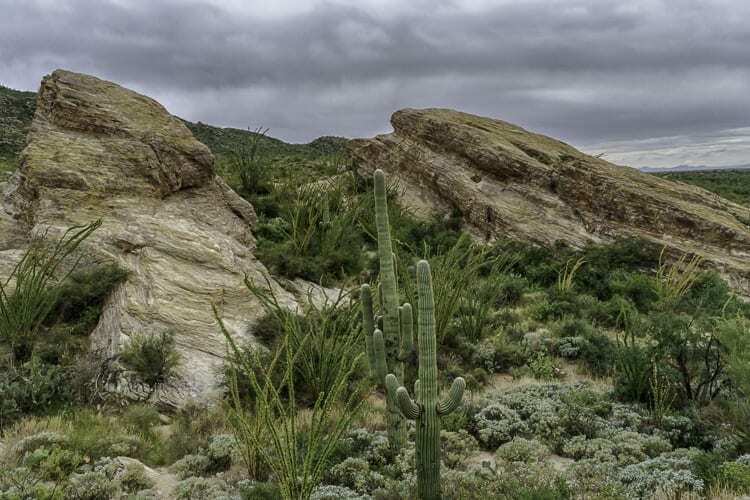 The Saguaro National Park would be my first choice but the botanical gardens look equally fascinating. It reminds me of my visit to Scottsdale. I love to see a cactus in bloom and you obviously saw so many. What a great getaway from Phoenix. @Carol, this whole area has been one fantastic surprise after another. Tucson will draw me back again and again because of the focus on food. Wow you’ve highlighted so many fun and beautiful places to visit in Tucson! The landscape of Gates Pass is phenomenal!! I’m tempted to make it my next destination in U.S.!! @Cat, you won’t regret it if you do! So many things to do in Tucson! I love all the colourful wall murals and the cactus! The food looks tempting too. @Allison, it has so much to discover! @Calvin, in this part of Arizona, it is definitely dry except when the monsoons are going on. @Reshma, ha-ha, that is until they start slipping down… Tucson was a wonderful discovery, I can’t wait to explore more. Tucson has so much to do! This is such a helpful guide for someone who hasn’t had the chance to spend much time there. I had never heard of Saguaro National Park. The cacti are so perfectly shaped the way you’d imagine. I can’t believe it takes 75-100 years for the first arm to form. Looks like such an interesting place to hike and explore. I’d head right to that botanical garden cafe afterward. That looks like such a peaceful spot. @Jackie, there are a lot of great hikes in the area, and the botantical gardens would be perfect for an after-hike meal! I was recently road tripping through Arizona and can’t tell you how much i loved Tucson. It is such a beautiful place. Saguaro National Park is so unique and I spend so much time there just exploring it at a slow speed. I can’t wait to go back. @Archana, oh do tell! What were some of your favorite things you ate? I have never been to Tuscan & this has given me some guidance when I finally make it! @Mindi, thanks I hope you get there one day! Oooh I love the photo of you in front of the Tucson sign! You look fashionable – don’t worry about the pants, haha. I can’t believe it’s been so long since I’ve been to Arizona and seen some real, honest-to-goodness saguaro cacti! Also, if you do start writing in the botanical garden, I want to join you. Maybe we can do a blogging workshop there! @Julianne, the botantical garden would be amazing for a small workshop. The saguaro are so interesting, everyone keeps saying to be around one when they explode, I think that would be fascinating….from a safe distance! Tucson looks gorgeous — and you look fantastic!! @Katie, it is pretty awesome, definitely going to spend more time there. I feel great! I need to go there! This looks like it is my kind of place I love to visit. I love good food and a good mixture of history, art, and nature. Tuscon seems to have all this. Thanks for sharing this with us. @Pia, I highly recommend Tucson for all those things! We have been to Arizona before, but why we never went to Tucson, I just don’t know! It is breathtaking and it does seem to offer a lot to do!! The different colored houses remind me of Florida. Thanks for the recommendations about the food too. In my opinion, I have found that eating at the smaller out of the way places, serve the best authentic dishes. We hardly ever eat in the hotels we stay at. That’s part of the beauty of traveling, to not eat what we normally eat! I am pinning one of your pins also. TY for sharing this bit of geological history!! It looks like such a gorgeous place to visit. That’s my city! There’s so much awesome stuff to do and eat here! Glad you loved it. @Christine, awesome! What are some of you favorite eats? 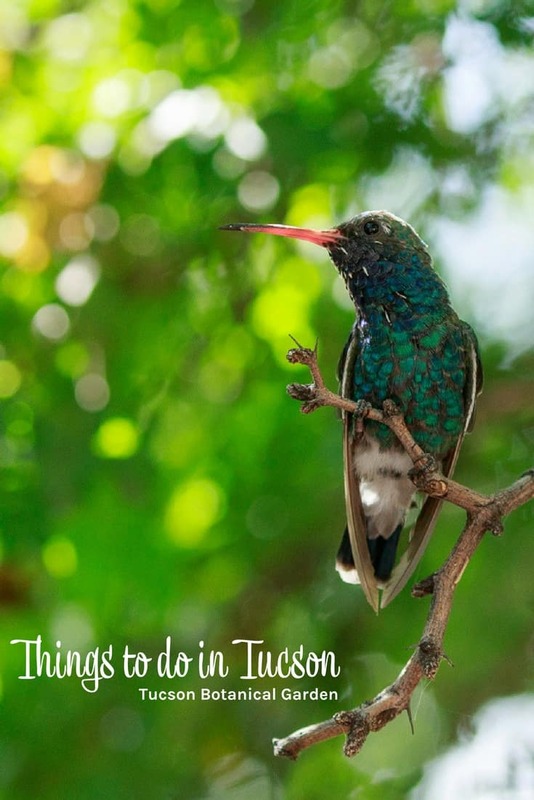 These are some wonderful suggestions to do in Tucson. I’ve never been there before. This seems like a good place to vacate. I use to live in mesa. Arizona is my favorite state! So much to do! I’ve been to Tucson a few times but have so much left to explore! Definitely go back to the Mission if you get another chance. I am for sure looking up those restaurants when I’m there next! @Tammy, we will be going back to the Mission for sure. Let me know what you think about the restos. @Bonnie, it really is a lot of fun! Such a great list! I’ve only been there once, to check out the temple that was recently built. And I have heard the Air and Space Museum is amazing. I’ve already pinned this for the next time I go back. Thanks so much!!! Great murals, and Barro Viejo looks so colorful! I’m so impressed with Arizona overall and how geologically diverse it is. You’ve inspired me to take a trip to Tucson and see more! 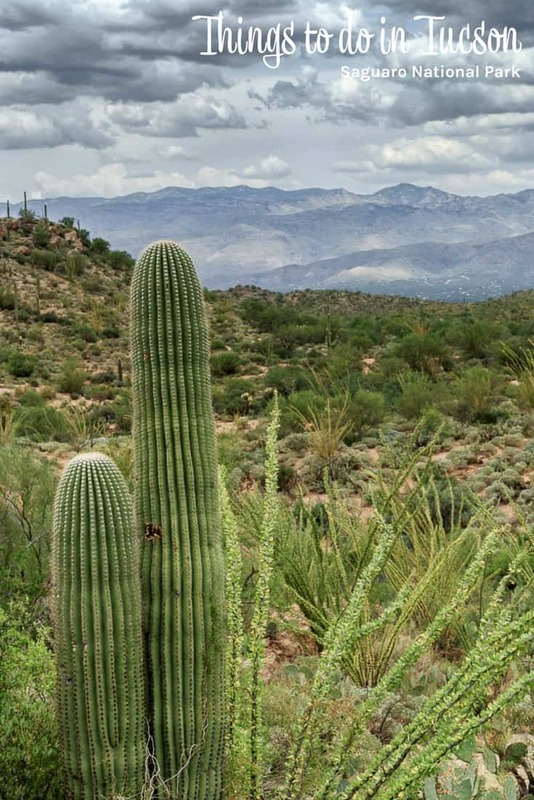 I haven’t been to the Botanical Garden yet, but I would also add Tohono Chul, which is like a mini-Sonoran Desert Museum on the north side – with a fabulous cafe! Also, Marana now runs a City of Gastronomy Food tour that is pretty interesting, next time you make it down here! @Leigh, I had just seen that in one of your wonderful post and had noted it down! Thanks sof the tip, Marana is also on the top of my list! Great post! I’m heading down to Tucson (from Michigan) tomorrow with my family. I appreciate the addresses for the murals. I’ve been trying to do some research to figure out where some of those are located so that helped a lot! I have to say that before the fire Old Tucson was a great place to visit. Since, though, the main attractions appear to be the movie memorabilia for the most part (what wasn’t lost in the fire). The shows are pretty good, but I have to say, the best time to visit Old Tucson is in October during their Night Fall event. The studios really come alive then.